This morning I went to my usual 8:00 a.m. water aerobics class and had an appointment nearby at 10:30. I’m usually showered, dressed and out of the gym by 9:30 so the logical thing to do was get breakfast at a nearby Panera Bread in between. I go there a lot and expected the restaurant to be relatively empty on a Friday morning. I got a surprise. 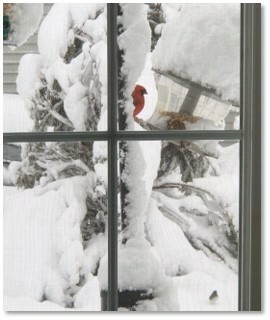 New England has been hit with two huge storms in a space of only two weeks. The first nor’easter coincided with astronomical high tides and caused major flooding along the coast. The second dropped 14 inches of snow inland that was so heavy and wet it felt like cement. Trees toppled, branches broke, and power lines went down, taking normal life with them. 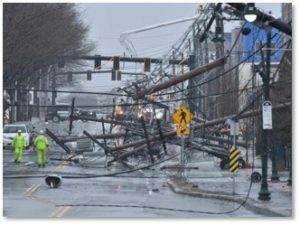 Some people had not gotten their power back after the first storm when the second nor’easter hit. This compounded the problem for line crews that were already working around the clock. Temperatures remained in the thirties and low forties: not low enough to burst pipes by cold enough to make unheated houses feel like tombs. We were lucky, experiencing no problems at all from Storm #1. I was happy to live on top of a hill 35 miles from the ocean’s storm surge. Storm #2 took down our power from some time on Wednesday night until about 2 p.m. on Thursday. Oddly, our lights and a few outlets worked on the first floor but the rest of the house had no power. I could cook on the gas range and the gas fireplace in the living room kept the temperature to an acceptable 61 degrees. So, no problems. When the power came back on, our life returned to normal and it is easy to slip back into thinking that everyone else’s life is normal, too. That’s where the surprise came in. When I walked into the restaurant, I planned to order my usual: steel-cut oatmeal with strawberries and pecans, along with coffee. Because I felt more hungry than usual, though, I decided to order a sesame bagel to go with it. Only they had none. 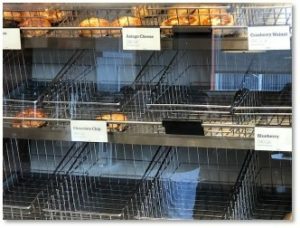 Panera Bread had empty bins where most of their bagel varieties usually resided. Only a few of the less-popular flavors remained. I took a fruit cup instead and wondered whether they had missed a delivery. Then I went to find a table in the dining room. Every table and almost every chair had someone in it. The place looked more like an office than a restaurant, with most people working on laptops and talking on their cell phones. Of course. They had no power. They came to Panera for a hot breakfast, to warm up, and to charge up their electronics. I found an empty chair at a long table and sat down. I remembered this scene from previous storms before we downsized to a different community. People go to whatever public space they can to get comfortable and approximate their normal lives. Once, I went to the town library and found every carrel occupied and every table crowded. Each electrical outlet was surrounded by people, many sitting on the floor, who were working and charging up at the same time. It’s not fun. Today, I am lucky. I left a warm, bright house and appliances that were humming away. I could work at my desk while a load of laundry sloshed in the washing machine. I could look forward to catching a couple of TV shows tonight. No ocean water surged through my home and no tree fell on my roof. Life is good. What I don’t understand, though, is why the power companies don’t do a better job of preventing these outages. It would make far more sense to put the power lines underground where snow and wind can’t affect them. Yes, that is expensive. I have read numbers like a million dollars a mile—although that sounds like an inflated estimate to me. Besides, it has to be extremely costly for them to run repair crews at weekend and overtime rates for 24 hours a day, seven days a week—for weeks at a time. Those crews, which often come from other states also have to be fed and housed—for weeks at a time. 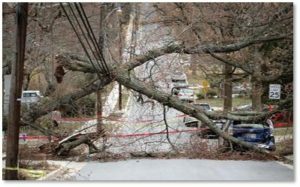 Then comes the cost of replacement lines, poles, and other damaged equipment. Also, consider the trees. Instead of cutting trees back from the power lines, the company allows them to grow right up to and, in some cases, hang right on, the lines that carry electricity to their customers. Sure, cutting trees back or removing them altogether costs money—although it seems far less expensive than repairs. Right now, though, a five-year-old could identify the potential problems where trees and branches can take down the lines. Where is the break-even point? What does it take for a power company, Eversource in this case, to decided that preventive measures are cheaper than gambling on the New England weather? We have had two strong nor’easter storms in two weeks. Guess what? We might have another nor’easter next week; it’s too soon to tell for sure. The power companies may not have noticed, but the world’s weather has grown wilder, more extreme. It’s likely to continue doing so as the Arctic warms and the sea ice melts. Company executives can gamble that continuing with business as usual will let them stay profitable but I wouldn’t bet on it. Sooner or later, power-line roulette will take down their profit margins just like their poor maintenance takes down the normal lives of their customers.